There are countless ways to answer that question; however, our answer lies in how the family represents themselves inside. Your furniture, your art, your knick-knacks, your books and movies, your family photos…these are the things that truly make your house your home. Here at Lott Furniture Co., we are invested in bringing you home and want to help any way we can! So, we are introducing a new series of blogs called Concept & Craft written specifically to do just that. We are doing the digging for you, so you can get your hands on the best design tips, DIY projects, unique finds, and newest trends in interior design. 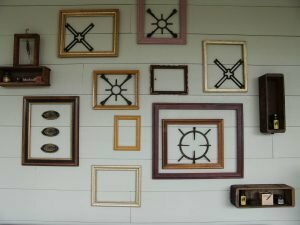 Gallery walls have been around for what seems like forever, but we’ve found some new ways to make them especially unique to you and your home. Traditionally, people have mostly used art and photos (Which is definitely still acceptable! ), but we wanted to show you guys a few unconventional options to mix up your gallery wall! Recently, we created a permanent wall cluster for our front window wall in the store and used only antique and repurposed items. And the best part is that we only spent around $50 dollars! Shadow boxes are always a great addition to a gallery wall. This one is an old sewing machine drawer! Anything can go in shadow boxes. We used ink bottles and old odds and ends. 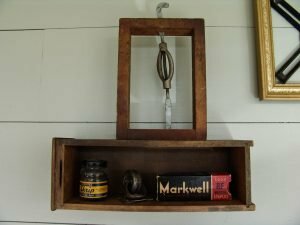 We headed on over to The Rusty Chandelier and bought some old antique frames of all different shapes and sizes, found some old stove parts in The V, and repurposed a few sewing machine drawers into shadow boxes for some vintage ink bottles we discovered in the office. Try putting frames inside of frames. 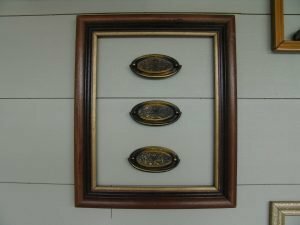 These are three antique drawer pulls we found upstairs! Don’t be afraid to think outside the box and use things that normally wouldn’t be seen hung on a wall. That’s what makes your space uniquely you. Choose your perfect frames from a wide, custom selection. 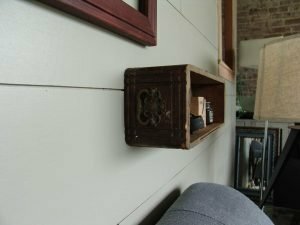 Upload your files or mail in physical pieces. 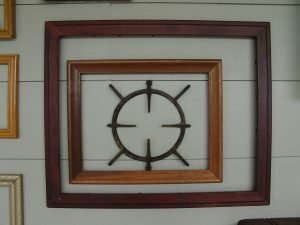 For some sample wall cluster layouts and extra tips click here and here. Also, one of the coolest wall clusters I’ve ever seen was on HGTV Home Town last night! Erin and Mallorie picked out a selection of antique plates and placed them in a unique pattern on the wall. Check out this video on HGTV’s website of how they did it here. And it gets better. You can get Laurel Mercantile Co. hand curated plate clusters on their website! Check them out here. This was the first of many blogs to come dedicated to help you make your house a home. Stay tuned to see DIY projects, useful design tips and tricks, and cool finds! Sign up in the gold box to get email updates every time we post! So glad to have all the leg work done for me!! Very well written piece!